Whether you would enjoy meeting old friends in Phoenix, dancing in Denver, touring the French Quarter in New Orleans, or going green in Portland, American Mensa’s Annual Gathering is just the ticket for your travel and intellectual needs. The 2019 Annual Gathering will take place in Phoenix, AZ July 3-7. Visit the upcoming AG homepage. American Mensa’s first Annual Gathering brought members together in New York City in 1963. Just 160 members attended the two-day “American Mensa Conference” at the Belmont Plaza Hotel. The $10 registration fee included morning coffee, lunch, evening cocktails and entertainment. Accommodations for out-of-town members were offered in the homes of local members, and the Pickwick Arms hotel was also recommended with prices starting at just $5 for singles. Since that time, more than 40 Annual Gatherings have brought Mensans together from around the country and around the world. 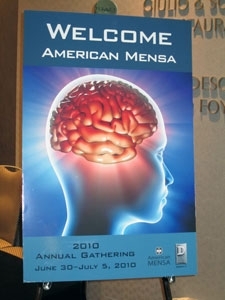 In 2010, American Mensa’s Annual Gathering in Dearborn, Mich., brought together more than 2,000 North American Mensans and their families for tournaments, events, tours, plenty of socializing, and presentations on everything from Henry Ford to Holocaust survivors, from improve to the economy, and from stem cells to steampunk.